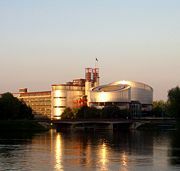 The European Court of Human Rights (ECtHR) in Strasbourg was established under the European Convention on Human Rights (ECHR) of 1950 to monitor compliance by Contracting Parties. The European Convention of Human Rights, formally named the Convention for the Protection of Human Rights and Fundamental Freedoms, is one of the most important conventions adopted by the Council of Europe. All 47 member states of the Council of Europe are contracting parties of the Convention which has the status of an international treaty. Applications against Contracting Parties for human rights violations can be brought before the Court either by other States Parties or by individuals. Founded in 1953, the Court became permanent and full-time in 1998, the first of its type in the world. The scope of the European Court of Human Rights and the legally binding nature of its decisions remain unique in international law. The ultimate aim, however, is for the need for legal protection and legal redress to itself become redundant. Instead, respect for rights and freedoms will become part of what makes people human. The vision behind the founding of the post-World War II European institution was not only to make war "unthinkable and materially impossible" but to change the way people think and act so that global solidarity, respect for rights, and for human dignity will become automatic, scarcely in need of legal protection at all. When the idea of a new Europe was proposed after World War II in which cooperation would replace conflict and war would become both unthinkable and materially impossible, those who supported the initiative that founded the Council of Europe and what evolved into the European Union placed human rights at the center. From the outset, it was decided that principles related to respect for human rights and their protection would govern relations between participating states. The European Declaration of Human Rights was to serve as the foundation stone of a new society that respected fundamental freedoms and rights. Drafting and ratifying this was one of the first tasks of the Council of Europe, formed May 5, 1949. It was, among others, Robert Schuman who, as one of the founding fathers of both the Council and the European Union, helped to place human rights firmly on the agenda. As France's foreign minister, he signed the European Declaration of Human Rights on November 4, 1950. The Convention came into force September 3, 1953, establishing the European Court of Human Rights and the Commission on Human Rights. Under the Convention, any European citizen can seek redress through the Court provided that all avenues available within their nation-state have been exhausted. The aim of the court is to protect the civil and political rights of all Europeans. From 1953 until 1998, a two-tier system operated. First, the Commission adjudicated whether a petition qualified to be heard by the Court, then it was considered by the Court itself. The Commission consisted of members appointed for six years by their governments, but they did not represent their state. The court consisted of part-time judges. In 1994, the Council of Europe agreed to Protocol II, restructuring the Court with a single-tier and full-time judges. States are also required under the Convention to "to give effect to the ECtHR's findings" even though individuals petition the court. States are the respondents; they can enter a complaint about the actions of another state. The aim, too, is for member states to standardize practice. The preference is for states to ensure that their own processes protect rights. Applicants may be given legal aid by the Court. The Court became a permanent court with full-time judges on November 1, 1998, when the Commission was wound-up. Citizens now had the right to access the court directly. The new full-time Judges were elected by the Parliamentary Assembly of the Council of Europe. By the time Protocol No. 11 entered into force the Court had delivered 837 judgments. At the end of 2005 the Court had delivered 5,968 judgments. All member states of the Council of Europe have to sign and ratify the Convention. The court consists of a number of judges equal to the number of Contracting Parties, which currently stand at 47. Each judge is elected in respect of a Contracting Party by the Parliamentary Assembly of the Council of Europe. Despite this correspondence, however, there are no nationality requirements for judges (for example, a Swiss national is elected in respect of Liechtenstein). Judges are assumed to be impartial arbiters, rather than representatives of any country. Judges are elected to six-year terms. They can be re-elected. The court is divided into five "Sections," each of which consists of a geographic and gender-balanced selection of justices. The entire court elects a President and five Section Presidents, two of whom also serve as Vice-Presidents of the court. All terms last for three years. Each section selects a Chamber, which consists of the Section President and a rotating selection of six other justices. The court also maintains a 17-member Grand Chamber, which consists of the President, Vice-Presidents, and Section Presidents, in addition to a rotating selection of justices from one of two balanced groups. The selection of judges alternates between the groups every nine months. On September 18, 2008, the Court has delivered its 10,000th judgment, Takhayeva and Others v. Russia (no. 23286/04). The Strasbourg Court found violations of Articles 2 (right to life), 3 (prohibition of inhuman or degrading treatment), 5 (right to liberty and security) and 13 (right to an effective remedy) of the European Convention on Human Rights concerning the applicants’ complaint that their relative disappeared after being abducted from their village in Chechnya by Russian servicemen. Complaints of violations by member states are filed in Strasbourg, and are assigned to a Section. Each complaint is first heard by a committee of three judges, which may unanimously vote to strike any complaint without further examination. Once past committee, the complaint is heard and decided by a full Chamber. Decisions of great importance may be appealed to the Grand Chamber. Any decision of the court is binding on the member states and must be complied with, except if it consists of an advisory opinion. It is the role of the Committee of Ministers of the Council of Europe to supervise the execution of court judgments, though it has no formal means of using force against member countries in order to comply. However, the ultimate sanction of non-compliance is expulsion from the Council of Europe and thus becoming a "pariah" state within Europe. Furthermore, the European Union takes a keen interest in the Convention and Court (and its jurisprudence) so would not look kindly upon any EU member state that did not fulfill its Convention obligations. Due to the increase in awareness of European citizens of their rights under the Convention, the Court was becoming a victim of its own success. Some cases were taking up to five years before being decided and there is a significant backlog. For example, between November 1, 2003 and February 29, 2004, the Court dealt with 7,315 cases, of which 6,255 were declared inadmissible. A single judge can decide on a case's admissibility. Currently, three judges decide. Where cases are broadly similar to ones brought previously before the Court, and are essentially due to a member state failing to change their domestic law to correct a failing highlighted by that previous judgment, the case can be decided by three judges rather than the seven-judge Chamber. A case may not be admissible if it is considered that the applicant has not suffered "significant disadvantage." However, this is not a "hard and fast" rule. The Committee of Ministers can ask the Court for an "interpretation" of a judgment to help determine the best way for a member state to comply with it. Amnesty International has expressed concern that these changes to the admissibility criteria will mean individuals may lose the ability to "gain redress for human rights violations." In December 1977, the court ruled that the government of the United Kingdom was guilty of "inhuman and degrading treatment," of men interned without trial, by the court, following a case brought by the Republic of Ireland (Case No. 5310/71). The court found that while their internment was a violation of the convention rights, it was justifiable in the circumstances; it, however, ruled that the practice of the five techniques and the practice of beating prisoners constituted inhumane and degrading punishment in violation of the convention, although not torture. In 1980, the court ruled out the fetal right to sue the mother carrying the fetus. In Paton v. United Kingdom, it was discovered that the life of a fetus is "intimately connected with, and cannot be regarded in isolation from, the life of the pregnant woman." In 2003 and 2004, the court ruled that "that sharia is incompatible with the fundamental principles of democracy" (13/02/2003), because the sharia rules on inheritance, women's rights and religious freedom violate human rights as established in the European Convention on Human Rights. In 2006, the court denied admissibility of the applications of former Soviet secret services operatives convicted in Estonia for Stalinist crimes against humanity after Estonia became independent in 1991. Since the Russian military invaded Chechnya for the second time in 1999, the court has agreed to hear cases of human rights abuse brought forward by Chechen civilians against Russia in the course of the Second Chechen War, with 31 rulings to date as of June 2008 (including regarding the cases of torture and extrajudicial executions). In 2007, for example, the Court ruled that Russia was responsible for the killings of a human rights activist Zura Bitiyeva and her family. Bitiyeva herself had filed a complaint against Moscow with the ECtHR in 2000 for abuse while in detention but she was murdered in 2003 before the ruling was issued. Other cases ruled against Russia included the deaths (or presumed deaths after years of forced disappearance) of Ruslan Alikhadzhyev, Shakhid Baysayev, Nura Luluyeva and Khadzhi-Murat Yandiyev, the case of the indiscriminate bombing of Katyr-Yurt, and some of the deaths during the Novye Aldi massacre. As of 2008, ECtHR has been flooded by a complaints from Chechnya, what the Human Rights Watch called "the last hope for the victims." The building, which houses the court chambers and Registry (administration and référendaires), was designed by the Richard Rogers Partnership and completed in 1995. The design is meant to reflect, amongst other things, the two distinct components of the Commission and Court (as it then was). Wide-scale use of glass emphasizes the "openness" of the court to European citizens. The vision that lies behind both the European Convention on Human Rights and the Court was of human rights as a "a unifying ideal, one of the core values around which the people … of Europe would coalesce." Unlike the Universal Declaration of Human Rights which is not a treaty between states but a statement of good intent, the European Convention, through the European Court of Human Rights, is a legally binding document. Several member states have incorporated all or most of the Convention into national law, which means that most cases can be addressed by national courts. The defence of Fundamental Rights is recognised as a value that is essential to European identity, one that is part of our genetic code. It is something that structures the whole European project and which allows the Union to be defined as a Union of values. And the unconditional affirmation of these values is also what the world expects from Europe. The promise of international and national commitment to human rights and to non-violent resolution of disputes, which is also part of the founding vision of the new Europe, is that respect for human dignity and hatred of violence will become so much a part of who people are that injustice and war would eventually become unthinkable. ↑ The Schuman Foundation, Declaration of 9 May 1950, Robert Schuman.org. Retrieved December 19, 2008. ↑ Council of Europe, Protocol No. 11 to the Convention for the Protection of Human Rights and Fundamental Freedoms, restructuring the control machinery established thereby. Retrieved December 19, 2008. ↑ Alan E. Boyle, Human Rights and Scots Law (Oxford, UK: Hart, 2002, ISBN 9781841130446), 20. ↑ ECHR, Composition of the Sections. Retrieved December 19, 2008. ↑ ECHR, Judges of the Court. Retrieved December 19, 2008. ↑ Art. 46, European Convention of Human Rights. ↑ Art. 47, European Convention of Human Rights. ↑ Amnesty International, European Court on Human Rights: Imminent reforms must not obstruct individuals' redress for human rights violations. Retrieved December 19, 2008. ↑ European Commission of Human Rights, Ireland against the United Kingdom of Great Britain and Northern Ireland: report of the Commission (adopted on 25 January 1976) (Strasbourg, FR: Council of Europe, 1976). ↑ Sheena Meredith, Policing Pregnancy: The Law and Ethics of Obstetric Conflict (Aldershot, Hants, UK: Ashgate, 2005, ISBN 9780754644125), 11. ↑ ECHR, Grand Chamber Judgment in the Case of Refah Partisi (The Welfare Party) and Others. Retrieved December 19, 2008. ↑ 12.0 12.1 Human Rights Watch, Chechnya: European Court Last Hope for Victims; France, EU, Should Use Rulings to End Abuses. Retrieved December 19, 2008. ↑ Radio Free Europe, "Russia Ruled Responsible For Killings Of Four Chechens." Retrieved December 19, 2008. ↑ Islam Online, Russia Convicted in Chechnya Killings. Retrieved December 19, 2008. Goldhaber, Michael D. 2007. A People's History of the European Court of Human Rights. New Brunswick, NJ: Rutgers University Press. ISBN 9780813539836. Kempees, Peter. 1996. A Systematic Guide to the Case-Law of the European Court of Human Rights. The Hague, NL: M. Nijhoff. ISBN 9780792332817. Robertson, A.H., and J.G. Merrills. 1993. Human Rights in Europe: A study of the European Convention on Human Rights. Manchester, UK: Manchester University Press. ISBN 9780719033988. Wildhaber, Luzius. 2006. The European Court of Human Rights, 1998-2006: History, Achievements, Reform. Kehl, DE: N.P. Engel. ISBN 9783883571379. Court judgments, decisions and case law website. "Chechens taking Russia to court" - BBC News. European Court of Human Rights condemns Russia in media case - International Freedom of Expression Exchange. History of "European Court of Human Rights"
This page was last modified on 10 August 2017, at 18:31.